As a casual fan of the Star Trek series I tread lightly when discussing The Show or anything orbiting anywhere near The Show (see: fantasy nerd). It is not the wrath of the trekkie I fear, but rather getting trapped in a debate I am wholly unqualified to participate in. Don’t misunderstand me, as a child I loved TNG. My grandparents had a grove of avocado trees and I can remember building spaceships in the trees, commanding the star fleet that was my sister, my aunt and myself as we rescued whales and saved distressed planets from extinction. So if you love the show so much you built a life-sized replica of the Enterprise bridge in your garage, just rest assured all of my errors and newb-like terms come from a place of love. A few weeks ago I heard a podcast episode about the influence of TV & Movies on the interfaces that surround us. It was a fascinating discussion with the authors of “Make It So: Interaction Design Lessons From Science Fiction”. What I remember most from this interview was a discussion about The Star Trek Communicator and how it affected the invention of mobile phones. It turns out that Dr. Martin Cooper, inventor of the first handheld mobile phone, designed the first prototype of the “flip phone” so that it more closely resembled the Star Trek Communicator. I wanted to follow in Dr. Cooper’s footsteps and see if I could quickly build an in-browser version of The Communicator using Twilio Client. Why Client? Well I wanted to easily initiate a Twilio voice call in the browser without the use of any actual phone device. Plus there are a few added bonuses to using this method. First, I didn’t have to buy a Twilio Phone number since Client can simply point to a Twilio application when looking for Voice and Messaging URLs. Secondly I don’t need to manage a database since I can simply store my recordings in my Twilio account (free up to 10k minutes) and access them later via the REST API. It just seemed too poetic to pass up, not to mention extremely simple. Here is how I did it. A starship Captain visits a web page with a button labelled ‘Record’ and a series of lights indicating the status of the recording. When the captain clicks the button the red light will glow and she will hear instructions to leave a captain’s log after the beep. The recording will begin and the captain can talk until she clicks a ‘Stop’ button or the recording will timeout after 15 seconds. After the recording is complete, the captain’s log will be played back. The recordings will then be displayed on a separate page through the Twilio REST API. Write TwiML instructions that prompt a Captain to record his log. Point our Twilio Application to the url of our TwiML instructions. Write HTML that displays the recordings from our account via Twilio Rest API. A TwiML Application is just a named collection of URLs responsible for returning TwiML instructions to control phone calls and SMS. Creating an app on Twilio is pretty simple. Log in to your account on Twilio.com and you’ll find TwiML apps underneath Dev Tools. Create a new App and name it whatever you want. In order to communicate with Twilio services without using a Twilio phone number we need to generate a Capability Token. You can think of Capability Tokens as temporary auth tokens for your application. Fortunately generating tokens is pretty easy when using a helper library. In order to create your token you’ll need your Twilio account_sid and auth_token. You can find both of these on your Account Dashboard. While you’re there you should hop over a couple of tabs in your Twilio account and grab the SID of the Twilio Application we created in the last step. With this snippet we created a Capability token using the helper object new Services_Twilio_Capability(). 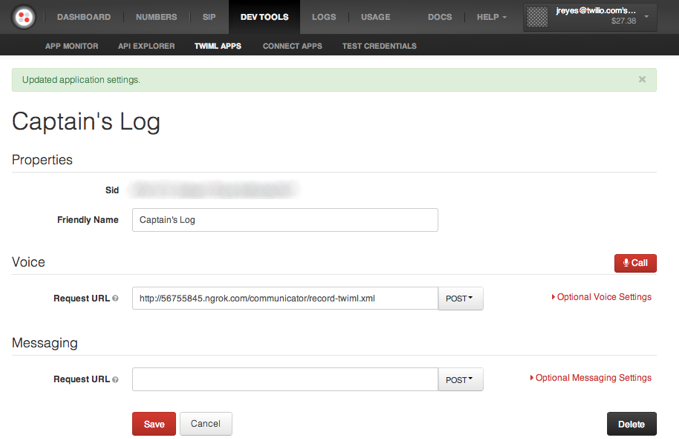 Lastly we enabled our Client token to allow outbound calls to our ‘Captains Log’ Application. These 10 lines of code are the meat of the application. In order to make the communicator look right and change state we need to add a little front-end code, but not much. The entire file looks like so. When the Client call is initiated it makes a request to the Voice URL specified in our Captain’s Log Application. That URL will return TwiML that will some instructions the audio and assign an action that will contain the TwiML that will playback the recording. 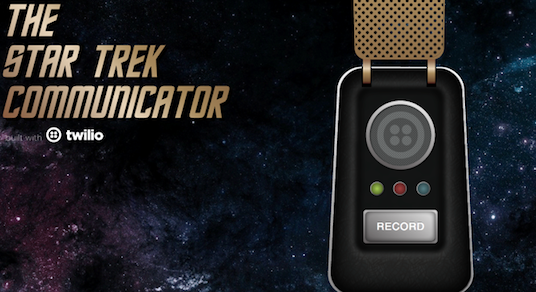 Record your captain's log after the beep. Once you’ve hosted your TwiML file (heroku, ngrok, etc) just add the url to the Voice field in the app dashboard. The last step to our Captain’s Log hack is to display a list of all of the recorded logs. Of course Twilio makes this extremely simple.